Print out the game board or draw a version of the board and paste on blank cards or postcards. Substitute your cities streets and landmarks for the games properties. Glue party information to the back side of Monopoly money or deed cards. Inside the Monopoly party invitation encourage party guests to come dressed up as their favorite Monopoly character or token and give prizes to the best costume. The Monopoly party can be decorated in the colors from the game board. Place monopoly boards on the walls. On the main table scatter property cards on a white or light blue table cloth. Make plates, cups, balloons and flatware mix and match in the monopoly colors so that every place setting is the color of a monopoly property. Have a parent or friend dress up like “Mr. Monopoly” and give out money to the guests randomly or when the they do a	good job. Dress another friend up to be the policeman and randomly send people to the jail space. They either have to roll doubles with dice (make 2 large dice out of packing boxes) or pay $50.00. If guests run out of money they must either answer a truth question (Community Chest) or take a dare (Chance) - if they complete their task they get $50.00. Set up different stations for what you will be doing and name them after the properties. Make huge property cards with the names and hang in back of the stations. Set a price for all the stations and games and when guests arrive give them $200 for passing “go”. For prizes give away monopoly money. Boardwalk Games - set up carnival type games like mystery fishing, tin can knock over and ring toss. You can find easy to make and cheap carnival style games on our carnival game page. Water Works - Have a water relay and the winners get a prize of monopoly money. For some fun water relays or our splash and water party games for more fun! Our party games page has great games for all ages! Players bid on the monopoly deeds using monopoly money at set times during the party (every 15 minutes). At the end the players turn in their properties for prizes. Give each party guest 500.00 in Monopoly money at the beginning of the party. 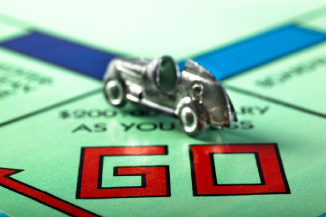 Hold an auction every 15 minutes for some of the properties - keep track by hanging a monopoly board on the wall. Give the property cards to the winners for them to carry around. At the end of the party the person with the most property or money wins a new monopoly game (or other prize). Before the party assign small prizes to each title deed. At the end of the party the guests can turn in their deeds for the prizes that match. Then guests can take their prizes home as party favors. 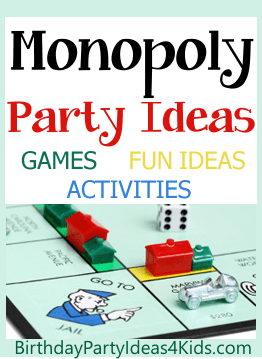 - see our list of party games for ideas. Decorate a sheet cake like the monopoly board. Individual foil wrapped hot dogs, popcorn, peanuts, cotton candy and snow cones - for “sale” at one of the stations with monopoly money. Have a prize table at the end of the party where guests can spend their monopoly money on candies and toys to take home. Silver chain with a monopoly token look alike pendent. White bags with a monopoly property card glued to the side.